Traffic in Lagos, Nigeria. Photo by Nick M.
Much of the growth of cities this century will take place in Africa, particularly sub-Saharan Africa. Already the region has about 200 million people living in slums, the highest number in the world, according to the United Nations. It was a little over a year ago that the continent’s population topped a billion; by early 2040, a billion people alone are expected to live in the continent’s cities. … now is the time for spending on basic infrastructure, social services (health and education) and affordable housing, in the process stimulating urban economies and generating much- needed jobs. Deferring these investments to the 2040s simply will not do. Not a single African government can afford to ignore the ongoing rapid urban transition. Cities must become priority areas for public policies, with investment to build adequate governance capacities, equitable services delivery, affordable housing provision and better wealth distribution. Projected population in African cities in 2020. Photo via BBC News. Many of Africa’s major cities are coastal, similar to some of the mega-cities of South Asia. It is essential for these cities, especially, to prepare for the likely impacts of global warming, including rising sea levels. “The West African coastline is retreating by between 20m and 30m every year,” according to a recent BBC News story. Other potential problems of rapid urbanization in Africa include informal urban land markets and slums, growing inequalities, and a large, unregulated job sector. “The State of African Cities” report does point to some good news, however. North Africa, particularly Egypt, Morocco and Tunisia, have reduced the percentage of the urban population living in slums. And cities in the region are responsible for 80 percent of Africa’s Gross Domestic Product (GDP), even though only 40 percent of the continent’s population lives in them. Africa is also experiencing less of a “brain drain” and more of a “brain gain” than it has in recent years, writes Under-Secretary of the United Nations Joan Clos, referring to the continent’s emerging entrepreneurial middle class. From a bird’s eye view, the report highlights a few positive transportation developments. 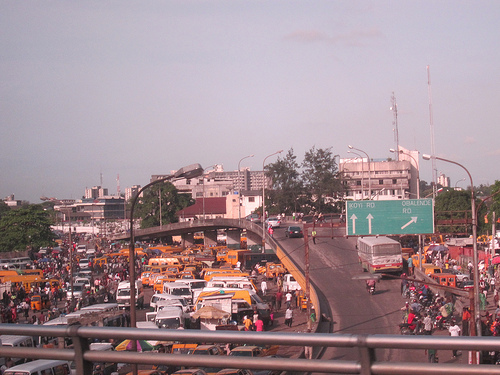 For example, Dakar, Senegal is “hampered by an obsolete and inefficient transportation network that provides poor connections between peripheral residential neighborhoods and the city’s commercial centre.” But in Lagos, home to about 18 million people, significant effort is underway to improve mobility through public-private partnerships developed by Lagos Metropolitan Area Transport Authority (LAMATA). Focus has been on the integration of urban bus, rail and water transportation networks. The recent development of bus rapid transit in the city has paved the way for BRT in the rest of Africa. The Member States of the Economic Community of Central African States (CEEAC) have adopted a plan to develop a reliable and competitive regional transportation network in a bid to stimulate effective and affordable regional movements and integration. Since 80 per cent of goods and 90 per cent of people in the subregion move by road, priority was accorded to the development of road connections, supported by a pledge of US $6.4 billion to develop or improve trunks roads between the region’s capital cities by 2010. However, progress is slow and it became clear that the objective would not be met by 2010. In less developed regions of Africa, the lack of good transportation is a basic infrastructure problem, along with issues regarding affordable housing and water supply, waste collection and disposal, air and water pollution, and spatial planning. Mobility is described in the report as being consuming, costly and often informal, needing immediate attention in most cities, especially in Central Africa. Under-Secretary General Achim Schneider of the United Nations Environment Programme recognizes the need to link land use, urban planning and transport in the face of rapid urbanization. “Inappropriate location of residences and work can generate significant but unnecessary mobility demand, private car dependence, air pollution and traffic congestion,” he says. “Any future reversal of erroneous spatial decisions in cities can be extremely expensive and difficult.” Therefore, as Africa approaches its next decade, local and regional actors will have to work together in order to develop successful mass transit, improve energy efficiency, address climate change, and promote good urban planning practices.